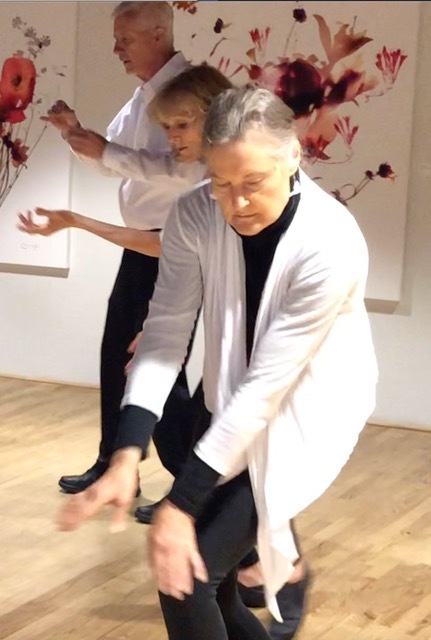 The message arrived in my email box: Calling All Members of the Parkinson’s Community who love to dance and move, you are invited to create a video of a crane dance. Now, who could resist an invitation like that? 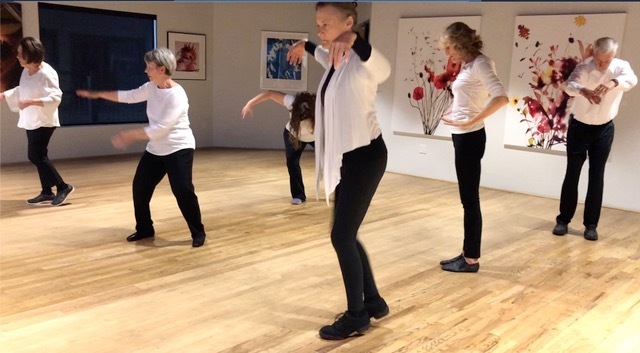 Our community of Parkinson’s dancers would create a dance and video to be included in a compilation video of international crane dances to be shown at the 5th World Parkinson’s Congress in Kyoto, Japan 2019. The Crane Dance project has been a series of ongoing delights, surprises, and ever-expanding admiration for the dancers I work with. Bits of a conversation I heard from various dancers as we started class one day give a flavor of the goings on through the course of the dance making. “It’s fantastic, this work. It’s helping me to look so much more closely at things – to really see. The videos I’ve watched, the dance I’m watching and making is helping me to notice and see a new beauty in things”. All that in the five minutes before class began, as we sat together, chatting and using spiky balls to roll out and warm up as everyone gathered for class. Our project started with nine dancers – three had to drop out along the way. The continuing dancers missed them – and stepped in to keep their ideas alive within the dance we made and to expand their own work. The dance had to be under two minutes. No problem, we’d been making one-minute solos in class for a while now. These dancers were ready and involved in every aspect of our project from music selection to the generation of movement ideas and creation of personal movement phrases. 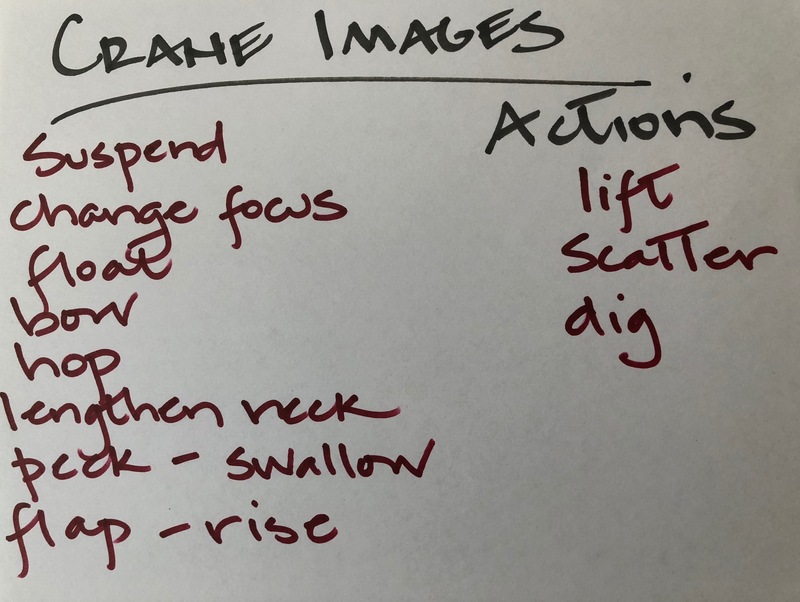 Our process included watching videos of cranes, having conversations about cranes, asking questions; “What ideas or images do you associate with cranes? What do you notice about their flight and behaviors? What interests you about them”? We thought about how those ideas could be expressed through action. We had music and sounds to guide us – swoosh – and images in mind. We were becoming crane experts! We explored what we had observed about cranes; a lift, a hop, a rise, fold, stretch… ) and then played with abstracting those actions, making them bigger, slower, or repeated, for example. We played with the idea of suspension and started to develop a vocabulary of crane movement. From that vocabulary, we developed a unison phrase to start us off. We would begin the piece dancing the same movement phrase, establishing ourselves as a community of cranes. The ending of the unison phrase allowed for variations in timing and the wing lifting movements that echoed through the crane flock. 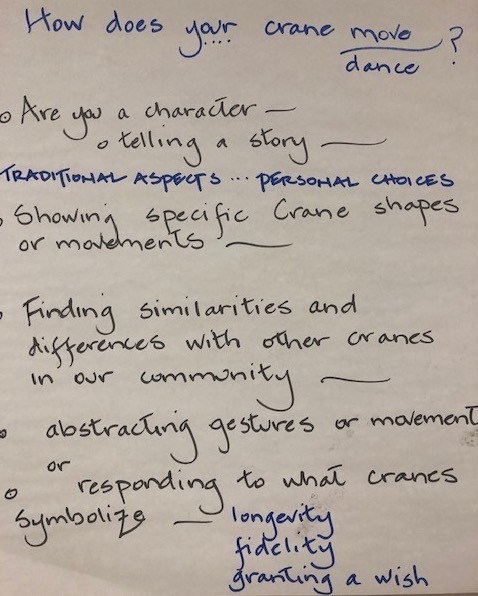 I loved discovering along the way that a group of cranes has many collective nouns, including a “construction”, “dance“, “sedge”, “siege”, and a “swoop” of cranes. Everyone then developed their own, individual movement phrase. We were individuals within a larger community, after all. We had explored lots of ideas through conversation, movement improvisation, draft, and revision. The basic structure of the phrase included a held SHAPE, transition moves into a new SHAPE, then transition moves into a third, final SHAPE. That phrase was repeated twice. Variations were welcomed. Lastly, we wanted the piece to end with a sense of hopefulness, a sense of taking flight, of moving “onward”. This project was about the process every bit as much as it was about the finished product. It gave us a chance to explore images, ideas, and expressiveness within a community of dancers. And so, we flew. The participants were choreographers, discovering and sequencing their own moves to embody ideas. They were dancers dancing. They built connections together having bonded through the process of exploring, supporting, laughing, working hard, and making something for themselves that could be shared with others. As one dancer said at the end of recording the piece, “It is always fun to come to dance class and to dance – but this project gave the dance we made a special reason – a purpose”. These cranes soared. The new year arrives with new resolutions, and expectations of resolutions, born out of the notion that we want to do or be, better..… We walk on two legs, reach with two arms and have two halves of our brain so we ’re pretty well set up to have a binary approach to things. That approach often plays out in a yes or no, this way or that manner. While devising a workshop that I will present this week with teachers and administrators on ways to include dance and theater in teaching and learning (otherwise known as movement and ideas in action) I considered similarities and differences between the wide array of curricular approaches. There is no “one size fits all” when it comes to administrators selecting curriculum frameworks, teachers teaching or learners learning. The educational world, based on good intention, research, and considered thought, tends to devise ‘new’ approaches, variations on approaches, and curriculum designs over and over and over again looking for effective frameworks to help students learn and understand. Each new variation is like a new years resolution. Although school districts may decide to use one particular approach for the delivery of curriculum or the assessment of learning, not a one of us is so binary that we teach or learn in only one way or another. No one approach completely works or doesn’t. While there may be an attitude of “all in” with a teaching approach or participants engagement with that approach, learning does not develop out of a single teaching style or educational framework. We may be binary in structure but we all have a bounty of individual quirks, interests, curiosities, and opinions evident as we develop our understanding about something. It’s not about finding the one way to deliver material to and with learners; it’s about opening possibilities for learners to engage with ideas; to come at things from different entry points; to look for the why and how beneath the “what” of the material being taught. One of the reasons the arts provide such effective ways to teach and develop alert learners is because there are so many different ways to learn through, with, and about the arts. Even as individuals build particular techniques or skills they each build a repertoire of skills somewhat differently. We do tend to get better at the things we practice, but only when we pay attention to what we are learning through the practice and continue to make adjustments and revisions to our work. The arts are active, they offer variations to the usual ways topics are presented in schools (emphasizing lecture, drills, and seated work). In contrast, the arts encourage engagement, physical involvement, analysis, synthesis of ideas, and creative approaches to problem-solving. We are sensory beings who learn by engaging with ideas in sensory-based ways – seeing, hearing, forming, feeling the idea or material we are exploring. Playing, viewing, listening, dancing, acting, drawing, making, creating are the verbs we DO as we think through the body as well as the brain. Learning with and through the arts help to form learners who have agency in their own lives and become agents of change in the larger world. So how’s this for a resolution that you can try whenever it strikes your fancy, or you find it purposeful? Engage with the arts. Make something. Look at something and ask yourself what you think of it. Move to an internal or musical rhythm as you walk the grocery store aisle or take your dog for a walk (the brain processes information differently when we move). What do you notice? Where does that thought lead you? What do you wonder about now? Yeah, that’s it. You’re engaged in artistic practice. For the last few weeks, my dance companions have been humpback whales. 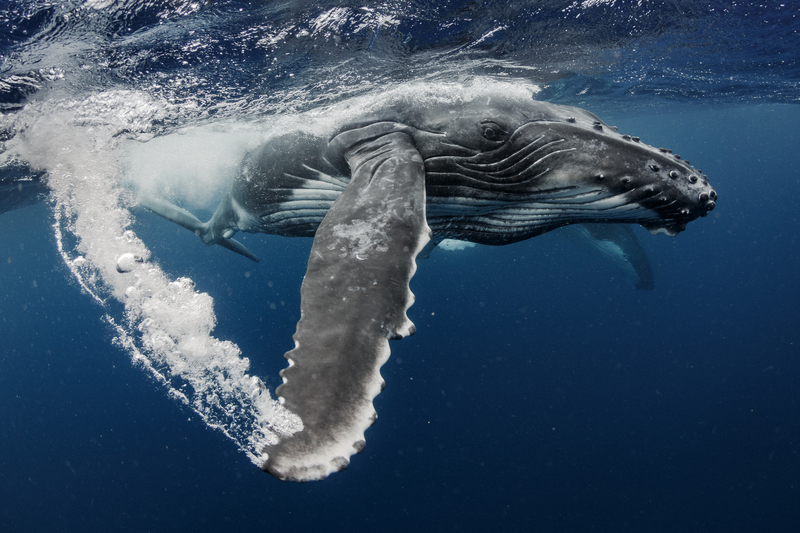 I have been swimming in the South Pacific with the humpbacks, listening for their songs, and scanning the surface of the ocean for signs of their presence; a spout, a tail slap or a breach. 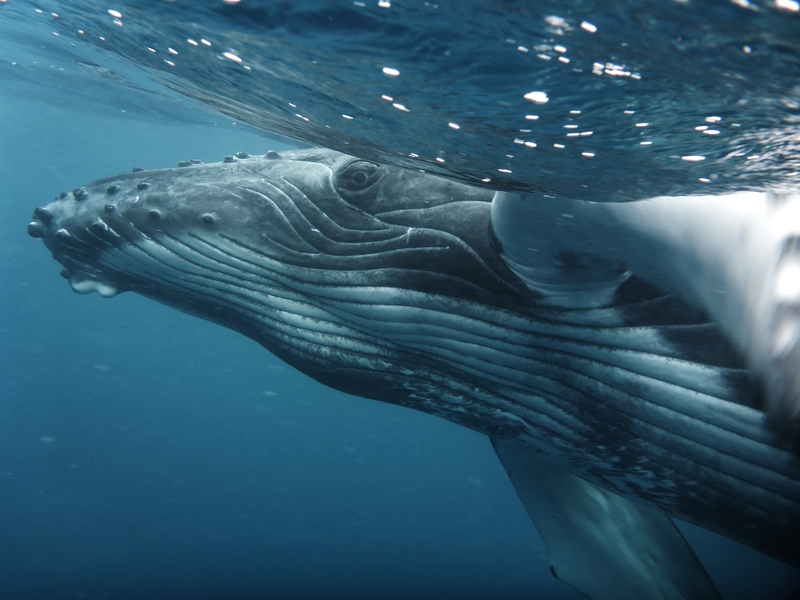 Our time together was a mesmerizing mix of physically demanding swims through choppy water with the hope of encountering the humpback mothers with their calves and male escorts. Initially, our swims began with a bit of trepidation (they are SO big! ), but we quickly transitioned to swimming with absolute joy at each encounter. I watched closely, observing their behavior, and then tried engaging them, with turns, swirls, and swoops of my own in the water, following the whales’ cues. Isn’t it amazing that we all have a particular body language, no matter our species? We communicate across distance, genus, and location through our gestures and inclinations – leaning and moving toward and away from one another as circumstance requires. Movement – it is our first language and in many ways is the language that connects us all. As I responded to the whales in the water, moving closer as they allowed, swimming back to create a bit of space for them to lift a pectoral fin and slap the surface, I thought of my dance classes and how these swims contain some of what we do in studio – transferring movement from one part of our body to another, sequencing movement with mobility and expression, building phrases, mirroring one an others movements and then responding through movements of our own. As I teach, I look to my dancers for clues during class. Are they comfortable with the particular combination I have given them? Has it prompted the intended result? Is there challenge and enjoyment as they follow the movement sequence? How are they expressing various movement qualities and styles? Is there something in the movement experience that is both challenging and engaging? I also looked for clues as I looked into the eye of a whale. Did they seem to be comfortable with my presence? Were they interested in engaging with me or others? Were they feeling playful, or intent on demonstrating their superior strength, skill in navigation; or just how magnificent it is to be a whale? They spoke through movement. 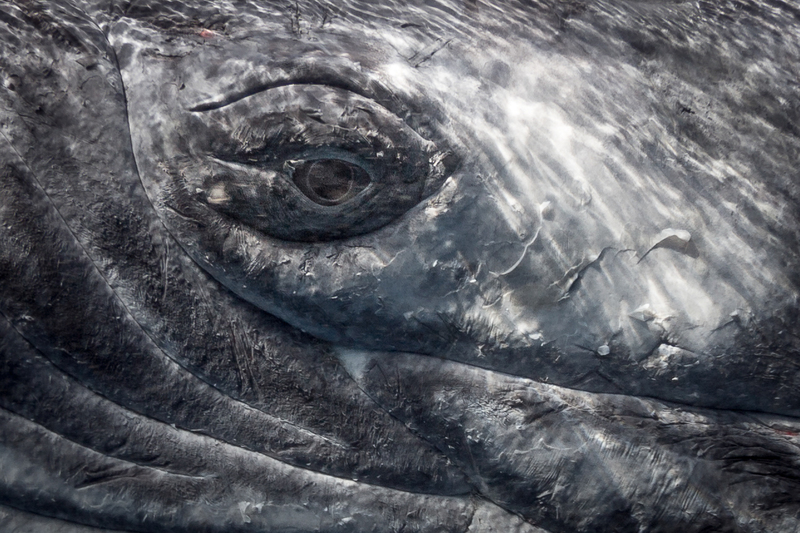 Eye to eye with a whale it becomes evident that across species we are all connected, and that we humans bear a responsibility to Step Up (ah ha – another dance term) to understand and, through our actions, protect these amazing creatures and their ocean home. It’s all there in the whales’ eye. 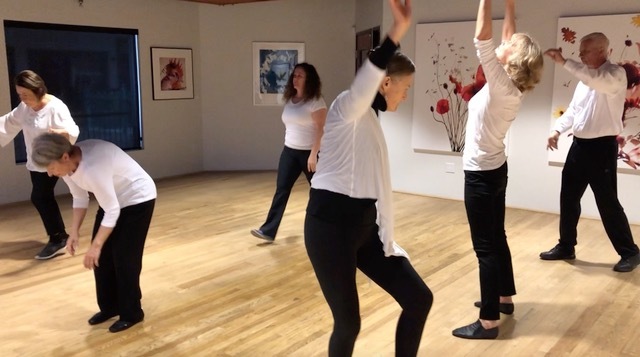 Building on last year’s successful launch of World Dance for Parkinson’s Day, twenty-three dance organizations from 16 countries came together again to honor World Parkinson’s Day on April 11th. That celebration will be followed by International Dance Day, celebrated each year on April 29. The richness, power, and impact of dance is showing up everywhere; in cities and communities across the United States and Canada, Europe, Asia, Africa, and Australia…. We celebrated the day in our Parkinson’s dance class by dancing a little Tango ( Argentina) and the Tarantella (Italy). We included some dance improvisations and crossed the studio floor to the music of St. Germain, ( France) Los Lobos ( US) and Baaba Maal (Senegal). One of the dancers was waiting for class to begin by rolling out some tight muscles with a spiky ball (http://www.melbourneosteopathycentre.com.au/how-to-make-the-most-of-your-spiky-ball/). A friend came in and sat down next to him.” How are you this morning?“, she asked. “Man, I can’t even reach down and tie my shoes today,” he said. “Oh, would you like me to tie them”? his friend responded. “Sure,” he replied. “Will do” she answered, “you’ll just need to help me up from the floor afterward.” We laughed, finding humor in the shared understanding and wonderful give and take of the moment. We smiled at the spirit of collaboration and community that is a part of all the dances we dance together. 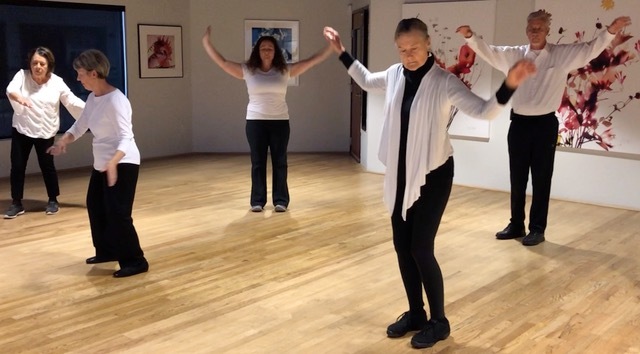 Our end of class reverence included a shout out for all the Parkinson’s Dancers across the globe. Here’s to teamwork in all its forms. Prompted by two very different but related events of the week I’m thinking about how the arts shape our lives. First, against the backdrop of white supremacists marching in Virginia I was left wondering about who those marchers were as children, who and what helped shape the perspectives and alliances they formed and then shouted on the street. How did their fears and limitations become their dogma? Second, I presented a workshop this week for teaching artists who provide arts programs for homeless and abused children. Free Arts Arizona, the organization that asked me to present the workshop, provides programs for youth using the healing powers of the arts to help build resiliency and trust. Discussions have and will go on and on about the value of the arts; art for art’s sake and participatory arts in communities; in learning and training, in civic engagement, in medicine, in therapies. We don’t need to decide the relative impact or value of watching extraordinary theatre on stage versus a performance devised by youth finding their voice. The relative value is, well, relative – housed in our own experiences and the impact of making, listening to, and seeing the arts.The arts have to do with communication, with artists melding talent, skill, creativity, and reflection to make work that didn’t exist before they did the making. As I left my workshop I couldn’t stop thinking about all the kids throughout this country who are abused, fearful, on the street, without resources or hope. What can we do to keep them from banging up against limitations that may lead them to become marching neo-nazis or members of the KKK who exhibit racism, xenophobia, homophobia, and antisemitism? How can we help them build their health, find options, develop curiosity and access humor as they recover from being thrown off kilter by the circumstances of their life? There are no simple answers to these questions. The interplay of emotional, physical, economic, and social circumstances that influence individual lives is complex and dynamic. The arts help us recognize and navigate that complexity, igniting our creativity and connecting us to our inner and outer lives. The arts provide us a way to move forward, expanding our comfort zones and building tolerance and interest in other ideas and people. When we do something we didn’t know we could; sing a song, perform on a stage, create a film, painting, or sculpture, dance with another, we find greater possibilities in life. If we don’t offer these options to struggling youth now what will our society be in the near future? The challenge is upon us to be less tolerant of violence, bigotry, and hatred and more responsive to the human heart. Joseph Campbell, the American mythology professor, writer, and orator best known for his work in the fields of competitive mythology and religion shared a bit of advice given to a young Native American at the time of his initiation: As you go the way of life you will see a great chasm. Jump. It is not as wide as you think. I have met many teachers who have been excited to try something new and see what happens. But time and again I have met and worked with teachers who take various workshops brimming with good ideas and approaches, who talk about the value of the arts and the ways arts integration can make a difference in students learning, yet they stop short of actually trying out the approaches. They could ask kids to get up out of their chairs to physically ‘discover’ a character by trying on various gestures, postures or walks embodying a stance or reaction to help them to find the “right” describing word for their story. They could ask students to create a movement phrase representing the essence of a Greek mythological god or explore how sound waves travel. Yet they don’t, and I wonder about the barriers or challenges that stand in their way. I know that teachers navigate full plates of demands and expectations. With large numbers of learners in their classrooms they are expected to individualize instruction, be alert to changes in a students behavior based on something going on at school or home, and cover identified curriculum on a specified timeline. Schools are also expected to provide medical care, meals, and police supervision for students The plate is full and getting fuller. And now I’m asking them to use the arts in their teaching practice as well. Yikes!! And yet, imagine……How can an active classroom help build attention, focus, and interest with learners? How will using image and action build clearer understandings? How does making and viewing help learners find evidence within the art work to support their interpretations or conclusions? How do the skills used in making a movement study or theatre scene make learning more memorable, nuanced, novel? After years of encouraging teachers, modeling the work and scaffolding the learning I feel its time to take a deep breath, summon a full voice and say “Just give it a go. Please.” In this era of 140 character tweets and 24/7 news cycles that condense complexity to sound bites I hesitate to call upon a marketing motto but really, as Nike has so successfully told us, JUST DO IT. Try asking kids to show what they think by moving their ideas. Ask good questions about the work. Be alert to the learning within the making. Try doing what so many parents have said at so many family dinner tables, “just take a bite.” Take a bite of new learning. TRY IT. See what you think, what you notice about the process and the outcome.Maybe that bite of broccoli needs a little seasoning or to be mixed with other ingredients. Adjust. Then try it again. A familiar theatre game is called “GO” – improvisation relies of the idea of “yes, and…..” When we move our ideas to investigate and show our thinking we go farther, forward into broader and deeper understandings. We can all gain new insight and perspective about teaching and learning when students are invited to access arts based entry points to ideas and avenues to understanding. I keep thinking about the ways the arts open doors and shed light. I think about how students are as unsure and nervous about learning, about doing it “right” as we older learners are. Teachers are asked to be the knowers but perhaps the best knowing we can offer comes in helping those we work with to consider ideas in new ways modeling our willingness to try something different, to experiment. Light may spill over the minds and actions of learners as they get up and move contrasting qualities of two poems or move a sequence of tableaux showing prediction, evidence, outcome. A process of draft and revision develops persistence in those making the work. I met recently with colleagues from a performing arts and education center that I work with. They were questioning, lamenting really, the gaps they see between teachers being given professional development resources, support from arts organizations and artist in residence programs and teachers bringing those ideas and approaches into their work and classrooms. For those struggling with uncertainty or hesitation I say, “Jump”.. It doesn’t have to be a big jump. As with many things a first step leads to next steps. That happens for us as teachers, as students, as humans. We are explorers in our learning and our lives. So take a deep breath. Take two. Jump. It’s not as wide as you think. It’s the start of a new year (we get the month to call it new, right?) and with it comes a chance to imagine some new options and outcomes for ourselves and for all those in schools. I recently taught a University masters dance course for teachers in Montana and I’m teaching another now in Colorado. I’m thinking, once again, about what is taught within school classrooms across the country, about what might be taught, and about how the choices will be made. Debates are launched and polemical pronouncements are made about curriculum that should be included in a public school education. People discuss the standards, state based, common core and whether they should exist at all. With the recent vote in Congress we have bid the “No Child Left Behind” bill farewell and moved onto the “Every Child Succeeds Act” which emphasizes state based decision-making regarding curriculum,standards and assessment. When it comes to public education there is the oft heard cry,“we need to return to basics”. Education has become focused on the mastery of a large body of information, even if it’s not likely to matter, in meaningful ways, in the learners lives. But what qualifies as basic? It is, of course, more than simply learning to decode and compute. Basics provide a foundation for learning and include finding ways to apply what we have learned to advance our understanding. Learning grows out of the basic practice of identifying and making meaning, accessing, analyzing, and synthesizing information. Considering the basics, what could be more meaningful than learning how to support, maintain, and use the body we live in? As the author Kobi Yamada has said, “ Be good to yourself. If you don’t take care of your body where will you live?” In this age of high levels of obesity and sedentary lifestyles how much do we know – and use – our physical selves? How do we learn to develop our kinesthetic sense and body awareness? We may study body systems at a rudimentary level in elementary school and figure out circulatory and respiratory systems – we might even re-visit anatomy at more complex levels later in high school and college. But, unless we have found our own avenues of interest, including sports, physical theatre or dance, how, or where, do we learn about our physical capacity? How do we learn to pay attention through action and sensory perception? We all speak with our physicality, with individual style, variation and specificity. Yet during our school years – and beyond – we are seldom asked to communicate, with purpose and intent, though movement. We are not learning about our own bio mechanics, ( the study of the structure and function of biological systems), developing somatic practice (internal physical perception),or exploring and expressing ideas though movement. Very little of our learning, in school or out, is devoted to finding ways to move effectively, efficiently, and expressively throughout our lives. How can we learn to be active participants on our lives using our bones for stability and our muscles for mobility? When will we take the chance to find structural alignment in our posture, dynamic flow in our movement, energy in our step? Well, I’ve meant to get a new blog written for a some time but I’ve been waylaid…. Closer to home, I was in Flagstaff for a Parkinson’s Dance master class and sessions with the Northern Arizona University dance students and students from the graduate Physical Therapy program. 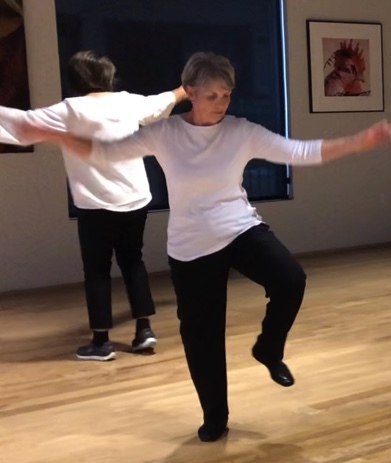 I’ve been teaching several Parkinson’s Dance classes each week and talking with people about starting Parkinson’s Dance classes in Tucson and Prescott. Our friends and family Thanksgiving celebrations included toddlers to sixty year olds dancing together. This month I’m beginning work with a consortium of International schools ,The Common Ground Collaborative, www.thecgcproject.org developing discipline standards, understanding goals, and teaching approaches in dance. Dance is everywhere – in schools and neurological wellness and movement centers, in University classrooms, on stage. I’ve been so busy making, watching, and teaching dance I haven’t had a chance recently to write about it. And that, at least in part,is the point. Dance has a vibrant presence throughout our culture and society. We dance in our homes, in our communities, on our own, with one another. Maybe we dance with music, maybe we are accompanied by our ideas and questions. As I advocate for dance’s greater presence in art, school, health, fitness and community life dance confirms its importance in so many ways. Dance. Do it for fun. Do it for expression. Do it for health, for meaning, for learning. Do it. In thinking about the impact dance can have on learning and community I have the same response. When it comes to learning, when doesn’t dance help? In the hands of engaged, thoughtful facilitators, artists, and teachers dance experiences can deepen and extend understanding. We can make and appreciate the arts while learning about ideas, ourselves, and others. Dance has to do with embodying and presenting images and ideas. It is based on critical and creative inquiry. It helps build empathy as we put ourselves in the positions of others. It encourages us to build a reflective practice,to connect and collaborate with others. As a bonus it helps us be fit and well. The conversations I have with professional dancers and performing artists are the same kinds of conversations I have with the elementary aged through Masters level University students I teach, with the teachers I work with who are engaged in professional development, and with participants in my Parkinsons Dance classes. We consider ideas, problems, solutions and conclusions. The conversations include some kind of reflection around the questions: Where are (we) headed?, Where are (we) now?, Where to next? We identify the questions that intrigue us and explore our research and response through dance. Need to understand how sound waves travel or how photosynthesis works? Build a dance about the sequence and timing in your elementary science class. Investigating literary or musical form? Make a dance in the form of call and response, theme and variation, or rondo form. Need to practice balance, cross lateral movements, and movement flow in skillful and beautiful ways? Any dance technique class, including a Parkinsons Dance class, will include that. Dance is an artistic process based on perceiving,analyzing, and reflecting. Rehearsing for performance or working with a group of classmates to show an idea requires inventing and presenting images, drafting and revising patterns and phrases, collaborating with others. The artistic process is how we learn and the arts provide the mediums by which we show what we think. Of course, the artistic process is not limited to the arts. Acts of analysis, idea testing and reflection are critical in math and the sciences as well. The reach of the arts extends beyond the arts themselves. I’ve just finished teaching this terms masters program course in Dance and Kinesthetic Learning for Lesley University. http://www.lesley.edu This course brought together a group of wonderful,varied educators from the front range of Colorado. All of them share a background in art, though few of them share a similar focus in their artistic work. One is a ceramicist, one a songwriter, a few are musicians and perform in musical theatre. Several of them are writers, one is a painter. Other than frequent forays to a local country western bar that offered line dancing class, some zumba classes and a bit of show choreography none of them had studied dance for several years – or ever. 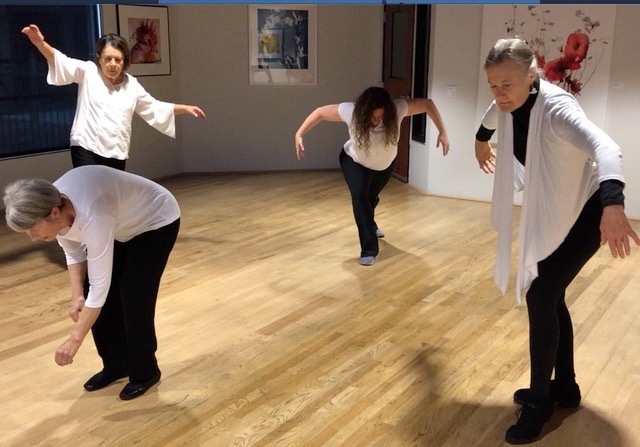 We had a great time throughout the course, exploring the elements and layered expressions of dance, considering choreographic process, and the ways that dance and movement informs our cognitive process, our perceptions and interpretations, the development and demonstration of meaning. During the course we listened to Alvin Ailey talk about the family stories he heard growing up in Texas and saw those stories fuel his choreographic vision leading to his signature piece Revelations. https://www.alvinailey.org/performances/repertory/revelations. We explored the relationship of music and dance while looking at Mark Morris’s choreography and project partnerships with the cellist YoYo Ma in the piece Falling Down Stairs – Bach cello suite. We considered how dance and music can stand as compatible but separate mediums ,exemplified through Merce Cunningham’s choreography and collaborations with the composer John Cage. We thought about dance as spectacle – the Olympics! as religious celebration and an expression of national heritage and pride. We considered dance as a personal expression and as a way to build community. We watched contemporary dance from Brazil,folk dance turned toward balletic form from Spain, and traditional dance transferred from its historic roots in agricultural India to contemporary wedding celebrations in England. We worked with pattern, dynamic,structure and narrative. Making improvised studies and crafted pieces, using the time-honored process of draft and revision we created,rehearsed, and presented our work. By the end of the course we felt like we’d done it all – right along with feeling like there was so much more to explore,discover,and make. Exploring that much territory requires playlists galore. We stretched, boogied,swooped and swirled through Bach to the Scissor Sisters, from Jay Z to Cuban rhythms. These masters students are teachers, which brings a particular flavor to the class. We thought about pedagogy – the method and practice of teaching. My challenge is to help them develop their artistic skills and alertness within the context of dance based learning with in their teaching practice and curriculum. And, as the restaurant server says” all served on a a bed of…..” In this case the bed is exploration, development, research, perception, production, and reflection ( this is where the terminology of waiters and teachers differs). So here’s what happened. We made dances that explored choreographic structure and form.We made studies about the elements of plot and music and mathematical vocabulary and form. We created dance based learning experiences to practice verb tense usage in a foreign language, to identify cause and effect in Pavlovian conditioning and to learn distinctions between bilateral, radial, gliding and rotational symmetry. Moving ideas – creating stories and images – and dancing. On our last day of class the group choreographed and presented a nine phrase dance based on the gods and goddess of Greek mythology. The dances became a performance of understanding that demonstrated content knowledge and interpretation. From Hades rule of the underworld and Poseidon’s rule of the sea, to Athena bursting full-grown from the head of Zeus,the work was fantastic – informed, inviting, thoughtful, fun!